Uglyworld #311 - The Last Can Of Irn-Bru (28-365), originally uploaded by www.bazpics.com. Wage had noticed in advance (around a month ago) that our stock pile of Irn-Bru was slowly being depleted so he took measures to ensure his own sanity by removing one of the cans and placing it in his "super-duper-extremo-special hiding place", which is otherwise known as behind the pillow on the bed in our spare room (just don't tell him I told you!). He planned to save this for whenever he had a down day and needed somewhat of a pick-me-up, unfortunately today that plan could have all turned to dust, thanks to Ice-Bat. 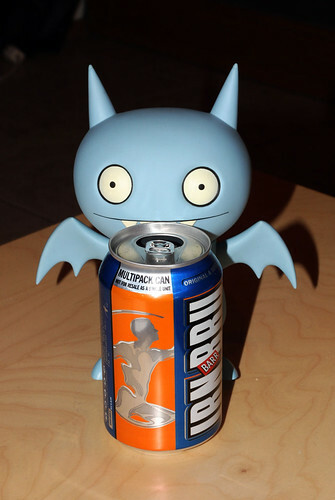 I couldn't really blame Ice-Bat, he was being helpful tidying up the house and just happened to discover the can of Irn-Bru behind the pillow. Now we already know that Ice-Bat's love Snow and Ice, but the lesser known fact is that they also love the Bru! Ice-Bat gave up on his tidying job to head downstairs to the living room where he planted himself in front of the TV with his prized (or should that be found/stolen) possession. When I came downstairs and found him like this I automatically had a look of shock on my face which automatically grabbed Icey's attention, he asked me "what's wrong baz" to which I answered "thaaaaat can of Bru, oh no, it's Wage's, and it's the last can we have". Ice-Bat didn't seem to understand the seriousness of what I just said and asked "But you can just pick up some more at the supermarket" - I then explained that it's from Scotland and not sold over here in Germany and his face changed completely. "Wage is going to kill me" he said, to which I couldn't find a nice reply...things could get turned upside down once Wage finds out!! !